In MGSV, the Fulton surface-to-air recovery system—used to send important personnel and items back to Mother Base by way of balloons—has a chance to fail when you’re in bad weather. Or when Niko Bellic’s around. He’s got real sticky fingers. 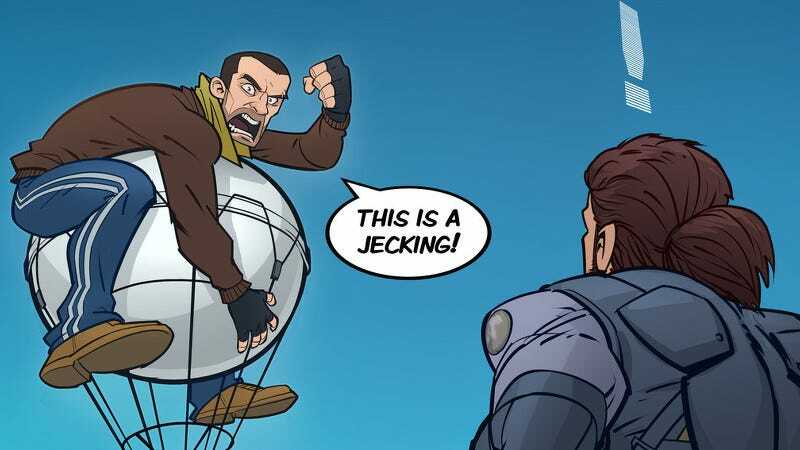 The drawing is the latest in a series aptly called “This is a jecking” by professional artist Patrick Brown. As the examples below show, it’s a series about GTA IV’s protagonist ruining (or trying to ruin) the day of other fictional characters. It’s pretty fun, so make sure check out the rest in this DeviantArt folder.